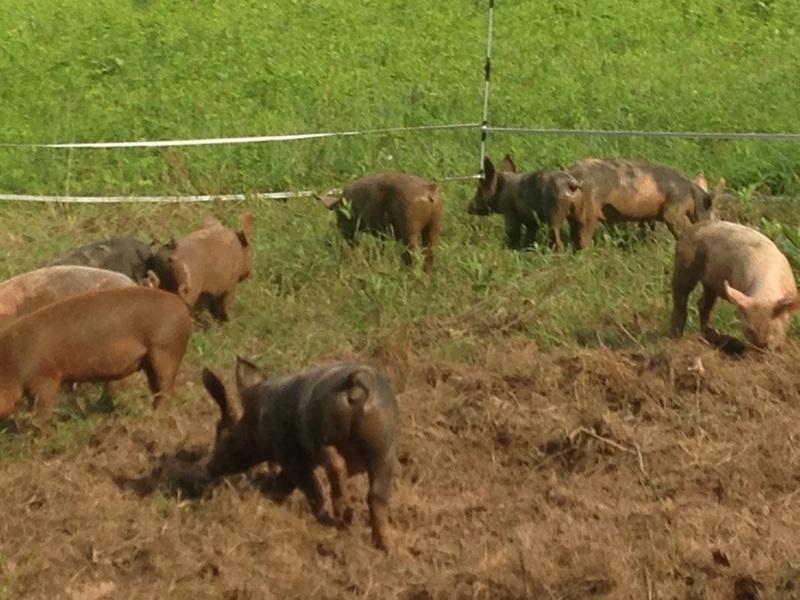 Our Pigs are mixed Heritage breeds which we pasture raise following organic practices. A majority of people don't even realize that pigs enjoy grazing just like horses and cattle. 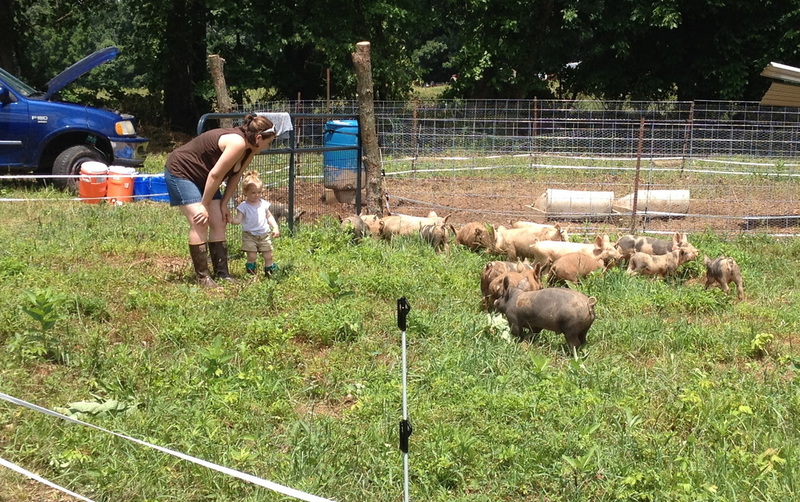 Our pigs graze through the field like champions! eating a variety of grasses. They are especially found of legumes like alfalfa and clover though we discovered (much to my delight) they will also eat our poison ivy! We practicing intensive rotational grazing, which means we divide our large pastures into smaller paddocks. 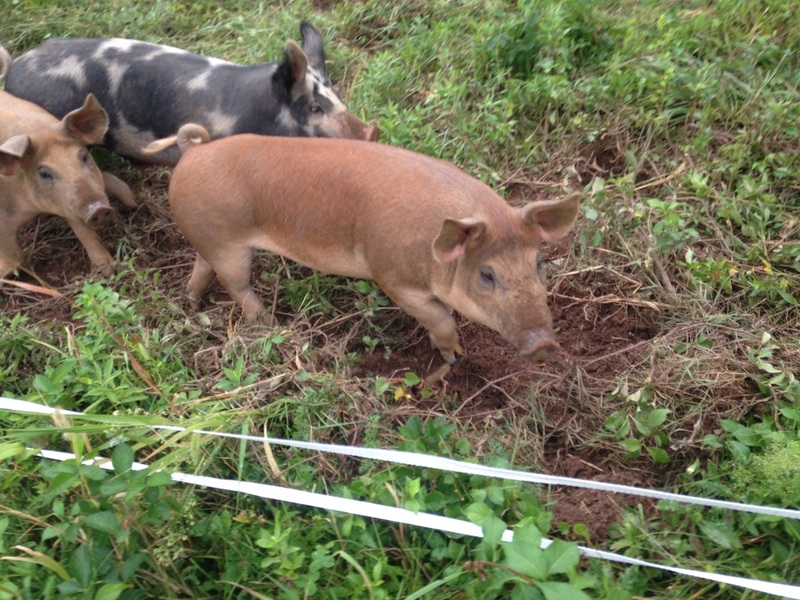 This allows us to move the pigs to a new paddock every week, ensuring they always have access to fresh pasture grasses and their environment never becomes to muddy or contaminated. Pigs do a wonderful job tilling up the ground as they go allowing us to simply reseed behind them without having to use a machine to plow the entire field. limiting plowing helps control soil erosion and leaves root systems in place allowing the pasture to recover more quickly which allows for faster rotations, which keeps the living environment for the pigs at optimum levels . 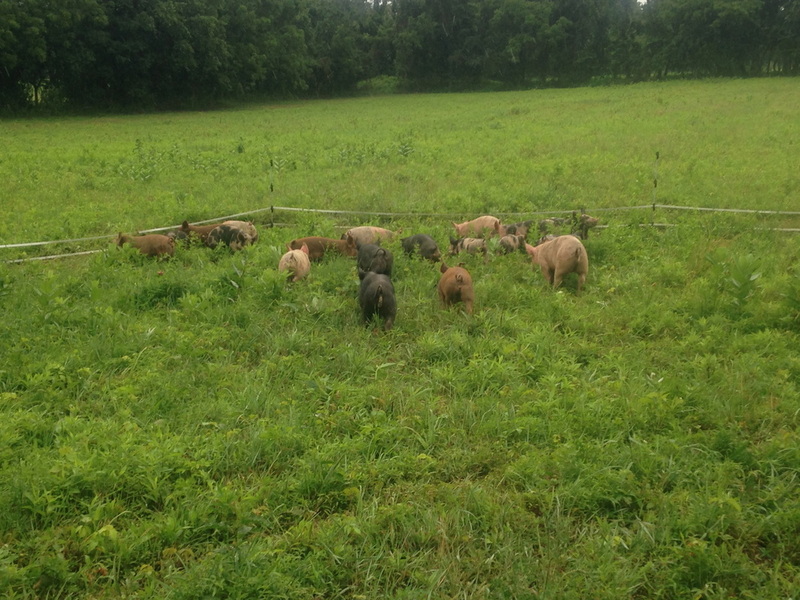 We supplement the pasture the pigs graze on with locally sourced organic feed to help bulk them up and ensure they are getting a full calorie load each day. 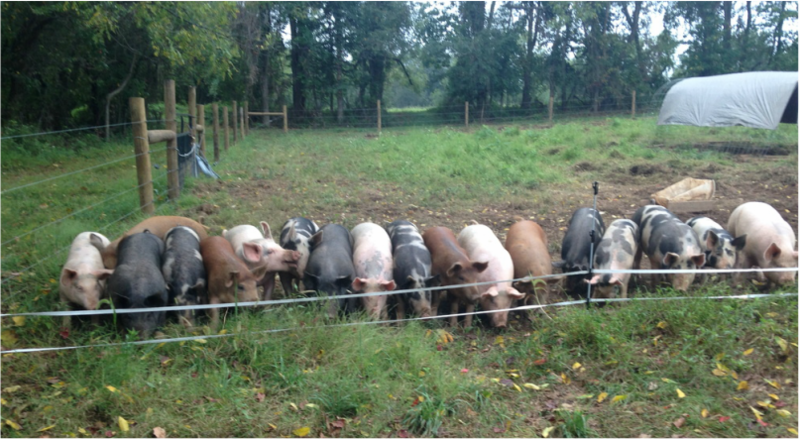 We are also very fortunate to be receiving Whey from a local cheese maker which is a real treat for the pigs! 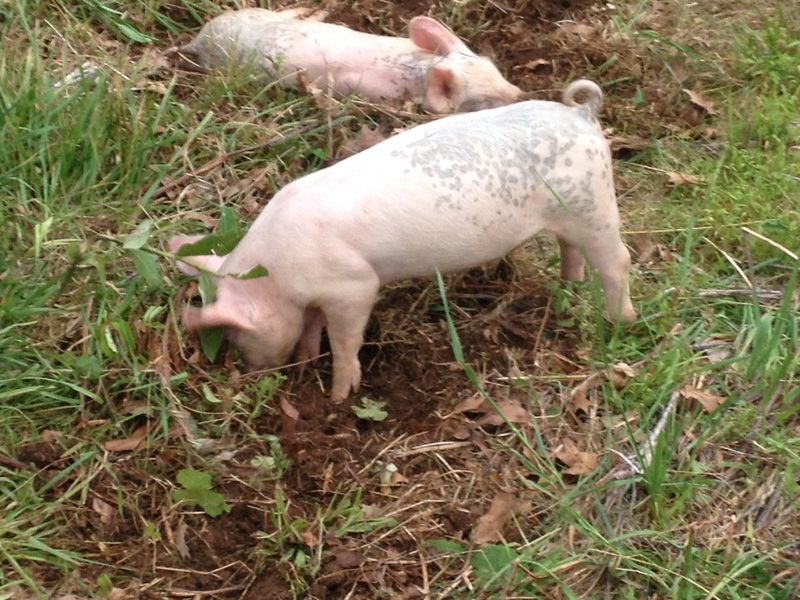 Allowing pigs to root and till up the pasture, allows them access to some essential minerals found in the soil, most importantly iron. Not only does this add to the quality of their life but it makes supplementing with synthetic iron unnecessary. 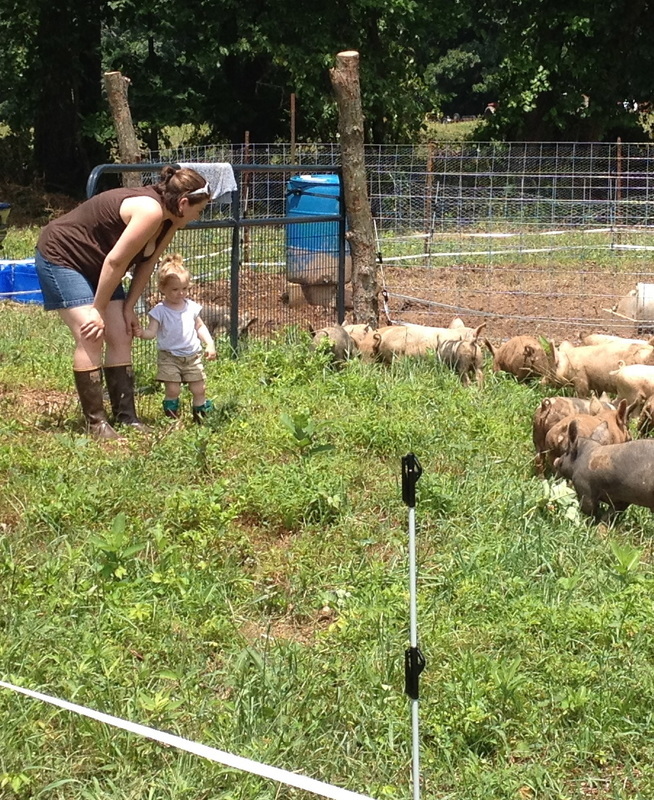 Rapidly Rotating the pigs through the pasture has the added benefit of working as a natural parasite control. 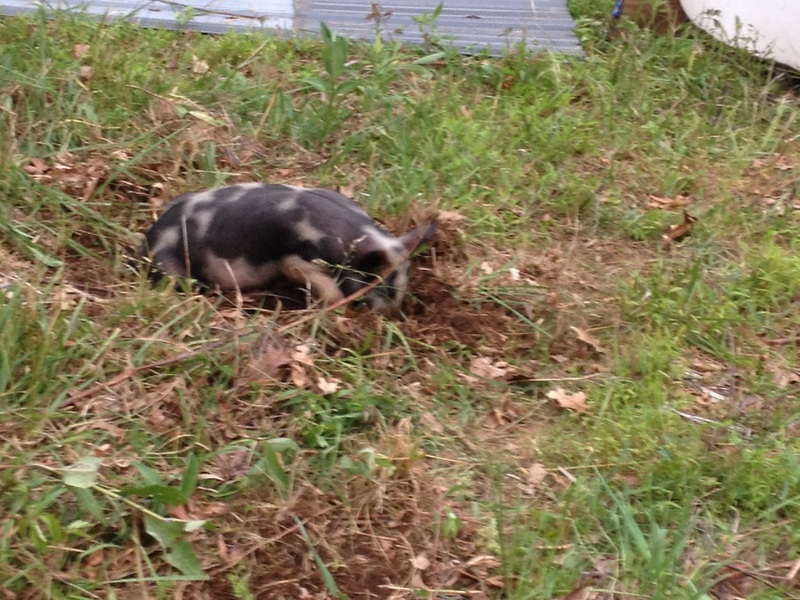 Pigs who are raised in confinement or on mud lots must be routinely de-mormed to prevent infestation. Moving the pigs weekly and allowing each area to rest for 30 days interrupts the parasite life cycle so the pigs can not be re-infected. This not only eliminates the need for chemical dewormers but also creates a cleaner healthier environment which also eliminates the need for routine antibiotic use.